In software engineering (especially XP) there is a commonly held belief that talking to a rubber duck will improve performance when debugging problematic code. This technique is referenced in multiple places from well-respected blogs such as Coding Horror (in a post about improving the quality of questions asked on this network, no less!) as well as multiple questions and answers on both the Workplace and Software Engineering stackexchange networks. and I also found a blog post about the underlying psychology of the technique. I have been unable to find any academic or industry body studies proving the efficacy of talking to a rubber duck. I don't think it is unreasonable to expect studies on this to have been carried out because similar, highly referenced, studies(pdf link) exist which show that pairing between real (i.e., non-rubber) humans does improve programmer performance . In summary this seems to be a widely held belief advocated by several strong voices in the community, and while there is a rational sounding basis for the mechanism of action and there seems to be a lot of anecdotal evidence, there doesn't seem to be any empirical studies proving this effect real. Does any empirical evidence exist proving that talking to a rubber duck improves programmer performance when debugging? How large, if any, is the effect? Is it comparable to pair programming with a human? The answer to the pendulum question is mostly just explaining a plausible mechanism of action but in my question I do not deny there is a plausible mechanism of action for the duck. I am specifically looking for answers with empirical evidence about the use of ducks in the domain of software development. I want to know how large the effect of consulting a duck is. (I have updated the list of questions above to reflect this). While there are academic studies referenced from the pendulum answer they relate to ideometrics (the proposed mechanism of action of the pendulum, but not the duck) so don't constitute an answer to my question. The answer to the pendulum question carefully limits the scope to questions which the pendulum can answer to questions which the asker already knows. The answer says questions like "Will he ask me to marry him?" are out of scope for a pendulum but similar questions may be useful in a pair programming or debugging scenario by prompting the programmer asking questions to which the they doesn't have the answer, to test that possibility, and to help them uncover new information. (E.g., "And so, Mrs Duck, this variable should be set to true when we enter this method...I'll just test that quickly to verify....Aha, it is false!"). 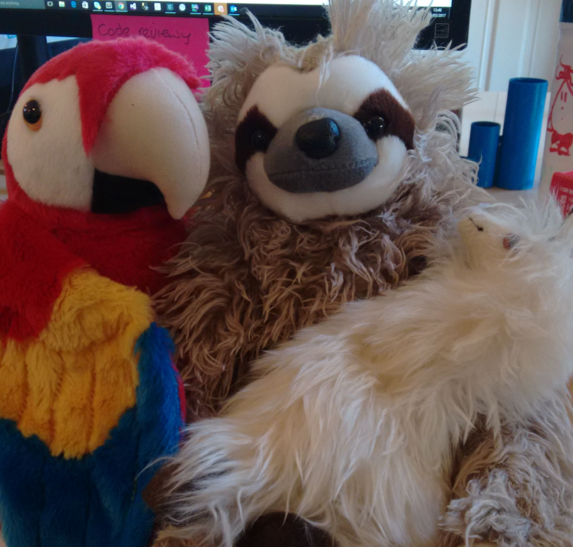 In case anyone I did not have a rubber duck available but I did consult a plush parrot, which can be seen photographed below (left), before posting this question but they were regrettably unfamiliar with the literature on this topic. You're not going to find studies that do something like compare the effectiveness of a rubber duck vs a stuffed parrot specifically for programmers working on debugging tasks, nor can we really measure the size of the effect, but your main question can be answered if we approach it at a slightly higher level: does talking through a problem aloud aid in problem solving? To which the answer is clearly yes. TAPPS is "Talking Aloud Partner Problem-Solving", where one of the partners is the "active" partner, thinking aloud through a problem, the other is simply a "monitor" or "listener", playing a role only slightly more interactive than our programmer's rubber duck. There is lots of scholarly research out there about TAPPS. Professor Jose Luis Villegas Castellanos, of the University of the Andes, Venezuela, said that discussing problems was a smart way to learn. "Those students who think aloud while solving a mathematical problem can solve it faster and have more possibilities of finding the right solution that those who do not do it," he said. The study, led of the University of Granada, Spain, focussed on final year university maths students, who were recorded while trying to answer complex maths problems. Those who detailed their thinking process aloud had more chance of answering the same question correctly as those who did not talk about their problem solving plan, the researchers found. Not the answer you're looking for? Browse other questions tagged software productivity programming engineering . Do pendulums have any explanatory power? Does listening to music while working improve mental ability? Does pair programming improve the correctness of software?